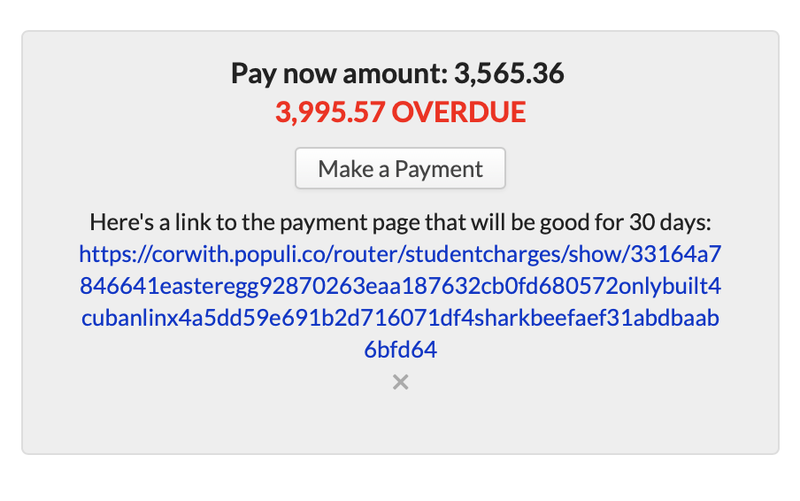 When you log in to Populi, you'll see an alert right on your Home page if you have an upcoming or overdue invoice. Click the alert to go to the payment page (described below). On My Profile > Financial > Dashboard, you'll see a list of unpaid invoices and your Pay Now amount. Click Make a Payment to go to the payment page. The payment page collects billing information from you so your school can process your payment. Enter the requested information accurately and completely. If you don't, your payment probably won't go through! If your school gives you the option, make sure you select the correct payment method from the drop-down (Electronic Check or Credit Card). The Payment Amount field is auto-filled with your Pay Now amount. If you wish to pay a different amount, do so by entering the new amount. Your school may charge a convenience fee for credit card payments. If it does, you'll see the total amount shown in the Your card will be charged... notice. To set up a recurring payment, choose Pay this amount monthly... from the drop-down, then enter the amount you'd like to pay every month. You'll be charged this amount every month on the date of your choosing for as long as you permit (until you cancel or a certain number of times). When you choose a payment plan, it sets up a recurring payment according to a schedule set up by your school. You'll be able to preview the plan before completing the payment process. You'll receive an email with all the details of the recurring payment or payment plan together with a link to view, pause, or cancel the recurring payment. If you cancel a recurring payment connected to a payment plan, you'll still be on the payment plan! Three days before your card or bank account is charged, you'll receive an email from notifications@populi.co containing the details of the upcoming charge. When you're ready, click Pay Now. Once you do this, your payment will be submitted and you'll be taken to a printable receipt page. If someone else is paying your bill, you can share a link to your payment page with them. On My Profile > Financial > Dashboard under Pay Now—OR, on the payment page—click Someone else paying? A link to the payment page will appear. Copy and paste the link and share it with the person who'll be paying your bill. The link takes them to the payment page and will work for them the same way it works for you.